Since 2014, the University of San Diego has hosted the California LDZ, one of NHI’s fastest growing programs, primarily serving students from the Western United States, but also drawing a significant Texas contingent. Rancho High School, located in Las Vegas, Nevada, has built a relationship with NHI dating back to 2014. Rancho students and alumni have graduated to Assistant Secretary of State and Secretary of State positions with NHI programs, and this past summer, the school sent five students to the California LDZ program to continue the relationship. An article in the Las Vegas Review-Journal article on Rancho’s award noted that nearly 75 percent of the school’s 3,235-strong student body is Latino. The Houston Independent School District, which sent 84 students to NHI programs this past year, has a long tradition of supporting NHI’s mission. In January 2016, the school district pledged $100,000 to fund scholarships for its students to attend NHI programs, $50,000 each for 2016 and 2017, which is the largest commitment of its kind to date. It’s also fitting that HISD is honored this year—Manuel Rodriguez, Jr., an NHI Hall of Fame honoree in 2013 and a longtime supporter of NHI’s work, passed away this July after 14 years as an HISD board member and a life of tireless public service. Currently a sophomore at the University of Texas at Austin, majoring in Mathematics with an Actuarial Science concentration, Pojman participated in the 2013 Texas Ambassador Great Debate, reaching the Final Four in Mock Trial, and the 2014 Texas LDZ, where she served as Senator Majority Whip. She’s been active in staffing programs and coaching students since then, including ongoing work with Austin students participating in the Texas Great Debate. Cordova first engaged with NHI as a member of the RGV team at the 2011 Texas Great Debate, then as Speaker of the House in the 2012 Colorado LDZ, and then a standout participant at the 2013 Texas CWS. He has most recently served as a John F. Lopez intern for two consecutive summers. Marlene Maldonado has been a Cotulla ISD employee since 1999 and a counselor at Cotulla High School since 2003. She was also instrumental in launching a scholarship program for the district, starting in 2012, to help Cotulla students attend NHI programs. This past summer, Cotulla High School had 23 students participate in NHI programs. In the school’s graduating Class of 2018, eight NHI alumni—including three who trekked to the 2017 International Collegiate World Series program—are all pursuing higher education, which Maldonado attributes to NHI’s influence. Gonzalez is a Texas State Representative from the 75th District (in El Paso County). 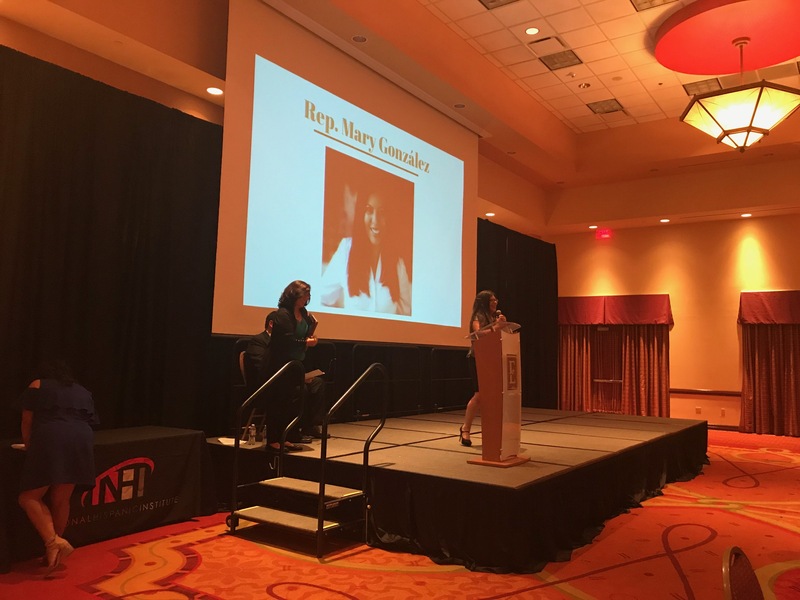 She was first elected in 2012 and was named “Freshman of the Year” by the Mexican-American Legislative Caucus. She has been involved with NHI since 1999, when she was part of the California LDZ, and 2000, when she participated in the California CWS. She also worked with NHI in the John F. Lopez Summer Internship program for three years, involved with the CWS program and with the Collaborative Research Center’s efforts. As a state representative, she has shown a commitment to her constituents, the statewide Latino community, and NHI principles of community social entrepreneurship, championing causes like special education funding, public school finance, and rural development and infrastructure. She has been recognized by a number of media outlets, including Latino Leaders for her leadership in education, as one of ten “Next Generation Latinas” by Latina, and as one of the 10 newly-elected politicians to watch in the nation by NBC Latino. Tijerina is a commercial real estate broker with CBRE in the Dallas-Fort Worth metroplex, specializing in connecting Latino businesspeople and entrepreneurs with retail and office space. He has a long history of involvement with NHI, dating back to representing the Tip of Texas at the 2005 Texas Great Debate, participating in the 2006 National LDZ and 2007 New York CWS, and then staffing a number of program from 2007 on. He is the former director of admissions for NHI, working at the organization’s headquarters from 2011 to 2014, and currently serves as project administrator for the NHI – Fort Worth region (serving Fort Worth, Arlington, and the rest of Tarrant County). He also serves as an education director for NHI programs, including the three most recent editions of the Texas Star Great Debate. Celebracion 2017 was sponsored in part by State Farm, DishLATINO, Union Pacific, Winston & Strawn LLP, and the Roy G. Kerr Foundation.